India on Saturday extended a $500 million (Rs 3,328 crore) line of credit to Vietnam to deepen their defence cooperation and signed 12 agreements including a deal to construct offshore patrol boats, amid China's muscle flexing in the disputed South China Sea and "emerging regional challenges". 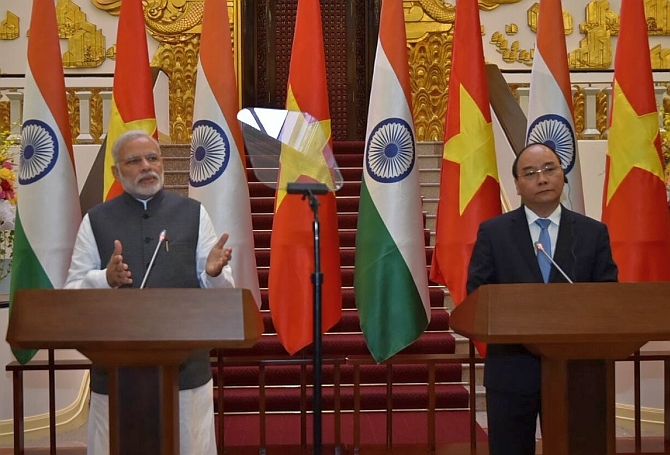 Prime Minister Narendra Modi, who held wide-ranging talks with his Vietnamese counterpart Nguyen Xuan Phuc in Hanoi, said the two countries have decided to elevate their strategic ties to a Comprehensive Strategic Partnership to provide it a new momentum. "Our decision to upgrade our Strategic Partnership to a Comprehensive Strategic Partnership captures the intent and path of our future cooperation. It will provide a new direction, momentum and substance to our bilateral cooperation," said Modi, who arrived in Hanoi on Friday on his maiden visit to this key south east Asian nation. Vietnam had earlier Comprehensive Strategic Partnership only with Russia and China. "I am also happy to announce a new defence line of credit for Vietnam of $500 million for facilitating deeper defence cooperation," Modi said after the signing of the agreements. The 12 agreements were signed in a wide range of areas covering defence, IT, space, cyber security and sharing white shipping information in presence of Modi and Phuc. "The range of agreements signed just a while ago point to the diversity and depth of our cooperation," he said, adding the agreement on construction of offshore patrol boats is one of the steps to give concrete shape to the bilateral defence engagement. Later in a joint statement, both India and Vietnam also called for "peaceful" resolution of the South China Sea issue and "exercise self-restraint". They also urged all parties to show "utmost respect" for the United Nations Convention on the Law of the Sea. Both sides called on "all states to resolve disputes through peaceful means without threat or use of force and exercise self-restraint in the conduct of activities that could complicate or escalate disputes affecting peace and stability, respect the diplomatic and legal processes, fully observe the Declaration on the conduct of parties in the South China Sea and soon finalise the code of conduct," the joint statement said. "They also recognised that the sea lanes of communication passing through the South China Sea are critical for peace, stability, prosperity and development. Vietnam and India, as state parties to the UNCLOS, urged all parties to show utmost respect for the UNCLOS, which establishes the international legal order of the seas and oceans," it said. China is involved in a raging dispute with the Philippines, Vietnam, Taiwan, Malaysia and Brunei over ownership of territory in the South China Sea, a busy waterway through which India's 50 per cent trade passes. India and the US have been calling for freedom of passage in the international waters, much to the discomfort to Beijing, whose claim over the sea was recently struck down by an international tribunal in favour of the Philippines. China has also objected in the past to India's Oil and Natural Gas Commission undertaking exploration at the invitation of Vietnam in the SCS, which is believed to be rich in undersea deposits of oil and gas. "Our common efforts will also contribute to stability, security and prosperity in this region," Modi said. He described his talks with Vietnamese counterpart as "extensive and very productive" and said they covered the full range of bilateral and multilateral cooperation. "We have agreed to scale up and strengthen our bilateral engagement. As two important countries in this region, we also feel it necessary to further our ties on regional and international issues of common concern," said Modi. "We also recognised the need to cooperate in responding to emerging regional challenges," the prime minister said, without naming any country. Vietnam has shown a keen interest cooperating with India in air and defense production. India's L&T will build offshore high speed patrol boats for Vietnamese Coast Guards, while a pact was signed on cooperation in UN peacekeeping matters. The Indian Navy and the Vietnam Navy will cooperate in sharing of white shipping information. 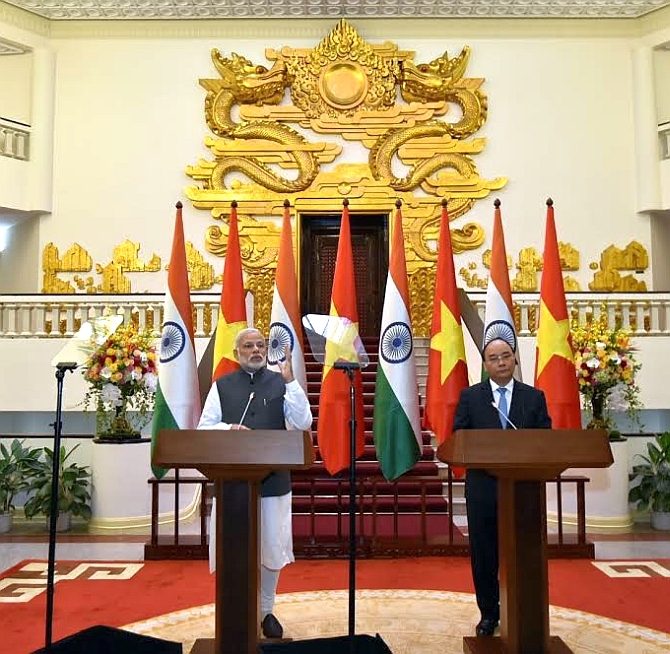 Modi said as the two important countries in this region, India and Vietnam feel it necessary to further their ties on regional and international issues of common concern. The prime minister also announced a grant of $5 million for the establishment of a software park in the Telecommunications University in Nha Trang. "We agreed to tap into the growing economic opportunities in the region," said Modi, the first Indian premier to visit the Communist country in 15 years. Noting that enhancing bilateral commercial engagement is the strategic objective of the two nations, he said: "For this, new trade and business opportunities will be tapped to achieve the trade target of $15 billion by 2020." 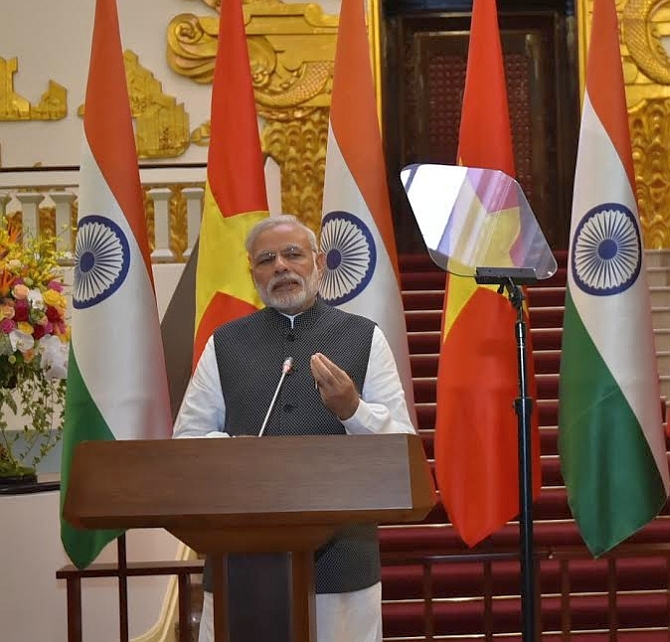 "As Vietnam seeks to empower and enrich its people, Modernise its agriculture; Encourage entrepreneurship and innovation; Strengthen its Science and Technology base; Create new institutional capacities for faster economic development; and Take steps to build a modern nation, India and its 1.25 billion people stand ready to be Vietnam's partner and a friend in this journey," Modi said. Noting that ASEAN is important to India in terms of historical links, geographical proximity, cultural ties and the strategic space that the two sides share, he said, "It is central to our 'Act East' policy. Under Vietnam's leadership as ASEAN Coordinator for India, we will work towards a strengthened India-ASEAN partnership across all areas."